THE SIGNAL drum sounds to let everyone know - the mantas are in the channel. That sends a lot of people scurrying for the small boats that will take them out to watch the giant marine creatures swim by as they feed on plankton. The tiny sea creatures flow through a narrow gap between Drawaqa and Naviti islands and the mantas swim against the current enjoying a good meal. The current can be very strong – too much to swim against for long even with fins – so the boats drop you in an area where you can snorkel in comfort to see the mantas and then go into the deeper channel to be whisked away down to where the same boats now wait. Before we enter the water the local guides tell us not to chase the mantas. Stay still and they will pass by and then come around again to check you out. If you chase them you can frighten them away. So with that in mind and camera ready it is over the side into a slightly choppy sea. Once the bubbles have cleared the head moves around to try to see a manta ray. One is swimming away down below and behind me. It seems to be going slowly but against the current it is actually moving gracefully with speed and power and is soon out of sight in the slightly murky conditions. Ah well, hopefully there’ll be another along soon. In the meantime my eyes are attracted to a myriad of bright-cloured fish that teem around the coral reefs on either side of the channel. Man, there are masses of them, zipping around with nary a care in the world … ocean … sea. Oooops have gone too far and am now in the current. Wheeee this is fun. I’m being pushed along at a great rate of knots – I can’t swim against so I go with the flow, so to speak. Holding my camera out steadily in front it is a real buzz whooshing through schools of fish that part for you as if by communal agreement. Stuff fun park rides, this is way cooler. Lifting my mask I can see the boats up ahead and groups of snorkelers holding on to a trailing rope line to make for the boat’s ladder in an orderly manner. Oh dear, missed the rope, oh here is the ladder. Lucky me. Sorry guys. Once everyone is back on board the boat cruises back to the head of the channel so we can try again. Remember, don’t chase the mantas comes the order. Okay, everyone nods, before disappearing over the side again. This time we are lucky, well sort of, as a manta ray is heading our way. It could be six to eight feet across and looks magical. All of a sudden my – and my GoPro camera’s - vision is filled with bubbles, flailing legs, flapping arms and even more bubbles. The manta powers away and I watch it disappear into the cloud of plankton from in between a forest of fins. On a family website I cannot tell you what I said through my snorkel, although I’m certain everyone around me knew I was not best pleased with their antics that went directly against instructions and shortened our experience through what I can only describe as selfish idiocy. A bit later our media party went out again to try to find mantas without hordes of flippering nongs around, but the graceful lady had decided enough was enough and was long gone. 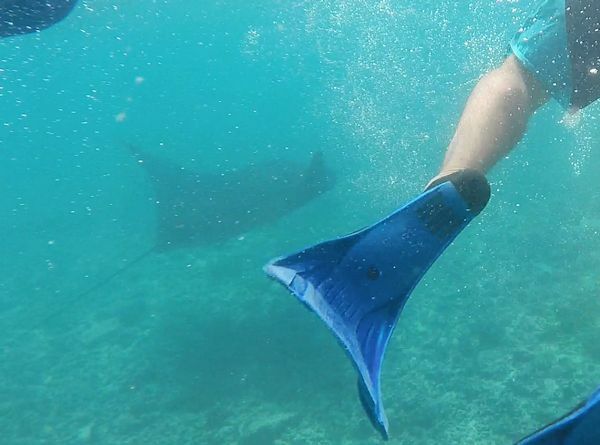 It looks likely there will be limits set in the future about how many people can see the mantas at one time and that is a good thing, for both the snorkelers and the creatures themselves. Despite that could I recommend time in the water with them? Absolutely.